Tarantulas originally got their name from a spider that is not a tarantula at all! In the region surrounding the southern Italian town of Taranto, the locals believed that the bite from the wolf spider was deadly and could only be countered by performing a wild dance. Those bitten would jump and spin until they collapsed from exhaustion. The dance was called the Tarantella, and it is this name that eventually came to describe large hairy spiders the world over. It is now known that the bite from the European Wolf Spider is harmless to humans. It was most likely the bite of a local black widow species that was making people sick. But the name stuck, and as Europeans spread around the world they carried the name “tarantula” with them. There are now about 820 species of large hairy spiders in the world that carry this name, all in the family Theraphosidae. A tarantula’s best sense is their sense of touch. Specialized hairs on the legs and pedipalps are sensitive to air movements and aid in nocturnal hunting. Other hairs on the legs are even used by the tarantula to ‘taste’ its environment. Unlike many spiders whose pincer-like jaws close in a sideways manner, tarantulas have jaws that strike downwards. The tarantula’s fangs fold along a row of spiked teeth. Prey is crushed against these teeth by the fangs. Next to the fangs are the pedipalps. These look like a fifth pair of legs, but have more joints and are specifically designed to grasp prey and manipulate soil during the construction of dens. Each leg ends in a pair of claws that are used for traction. Much like a cat’s, these claws are retractable. Tarantulas will use silk to line their burrows and as a sensory aid. They put our “trip wires” that tell them if predator or prey is near the entrance of their burrow. Female tarantulas are usually larger than the males and live longer. We have a few resident tarantulas here at Lindsay. There is the Chilean rose tarantulas (Grammostola rosea), a species very similar to our native California tarantula. 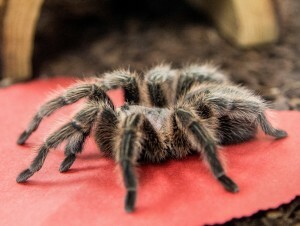 Chilean rose tarantulas are named for their range (Chile) and the rose-colored hairs on their abdomens. Like California tarantulas, they are burrowers and spend most of their lives underground waiting for food such as insects to wander by. They are also similar in size. They are common in the pet trade and are generally very calm when handled. Rose, Chile, and Tula are former pets and act as animal ambassadors at Lindsay Wildlife. The California Tarantula (Aphonopelma chalcodes), also known as the desert tarantula, can be found throughout the Bay Area, but is especially common on Mt. Diablo. The male California tarantula matures at around 8 to 12 years of age. Fall is mating season for these tarantulas, and the males begin moving up and down the slopes of the mountain in search of a female’s burrow. A male must find a female before the winter arrives; like other tarantulas he will die soon after maturing. It is not uncommon to see them crossing the road during these months. They may look large and scary, but like other tarantulas, they are harmless to humans. The bite is often compared to a bee sting. The California tarantula is not aggressive, but like all wild animals, it may bite if it feels threatened. It may be tempting to make pets of these easily caught and fascinating creatures, but all wildlife in the park is protected. It is illegal to catch and remove tarantulas from Mt. Diablo. We also have two blonde tarantulas here at Lindsay. Desert tarantulas, Aphonopelma chalcodes, are common throughout the Southwestern United States, especially Arizona, New Mexico, and Southern California.